Regardless of where you are, there’s no reason for you not attempt to keep your body in tip-top shape through exercises and other workouts. It’s not always about going regularly to the gym, after all. There are proven ways in which you can keep your body healthy without having to rely on a fitness instructor or a nutritionist.Take for instance the 7 Day Home Workout, Fitness Guide & Diet Plan app. It is a basically a treasure hoard of tips regarding not only various workout plans that you can choose to adapt but also different recipes and diet guidelines that you can follow to take better control of your lifestyle. 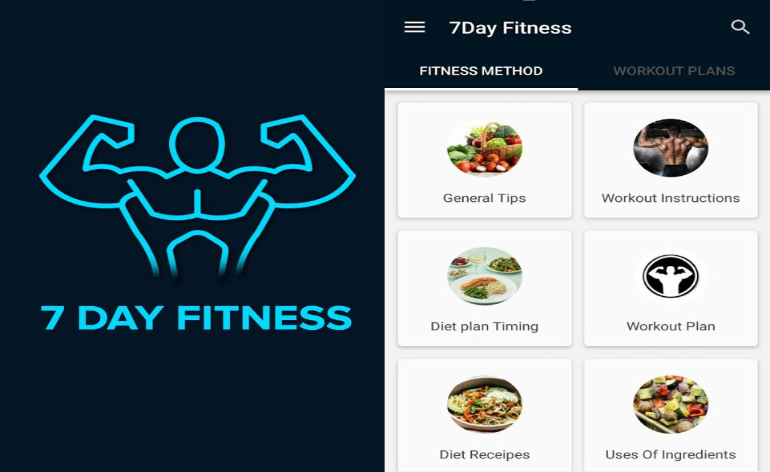 In the main interface of the app, there are numerous categories about Fitness and Diet Plans in general. It’s best to start from the top and work your way down as the first category is labeled General Tips, which gives you a good preliminary grasp of how the app offers the knowledge it is more than willing to share. You can expect to get only really helpful and original information from each category that you read. That being said, the app is direct and prioritizes brevity when sharing its guidelines. The instructions are presented in such a way that you won’t immediately get tired or bored reading them, which is what most instructional apps should present themselves. Whether you are looking for ways to boost your present workout, adapt new fitness regimens or plan and schedule your diet better, rest assured that you’ll learn a lot of new concepts about fitness as a whole – to the point that you can expect your entire perspective about health to change as well. That being said, the app really is perfect for those who are looking for ways to improve their physical well being without having to rely on a professional for the purpose. It’s easy to say that almost any information can be found from various websites online. But with the level of detail that this app has and the apparent authenticity of its articles, you would basically be getting a personal trainer-like companion at no cost. The main strength and outstanding attribute of 7 Day Home Workout, Fitness Guide & Diet Plan is its serving as a well of information from which you can easily gather all the essential knowledge about wellness as a whole. Its wide-ranging approach raises its value even more, as it doesn’t stretch its functionalities too much. It knows the right balance of focus on a topic (in this case, health) and inclusion of relevant subtopics. This quality is evidently the key to its success among users. The largely positive reviews it has gotten speak for themselves.